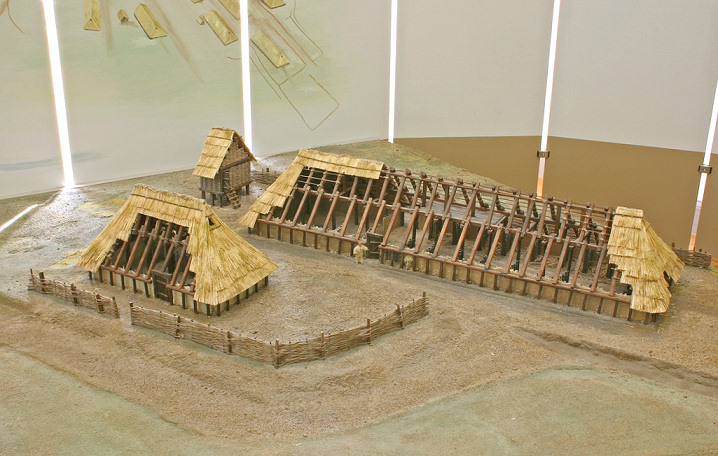 Vikings lived in long rectangle-shaped houses. They had walls made from local wood and sloping thatched roofs. Most houses had just one room for the family to share with a fire in the middle for: warmth, cooking and light. As they were worried about the building burning down, this fire was normally quite small. Any furniture was basic - perhaps just a wooden table and some benches for sitting and sleeping on. The floors were often bare stone or earth. Comfort came from rugs and furs used as bedding, with heavy wall hangings used to keep out draughts. Most people probably washed in a wooden bucket or at the nearest stream. Children were expected to work hard in Viking times. Boys were taught: farming, rowing and sailing. Girls were taught how to: spin, weave, milk cows and prepare food. When all the daily tasks had been done, boys probably played games and went fishing. Viking girls may have spent some of their free time gathering berries and mushrooms.